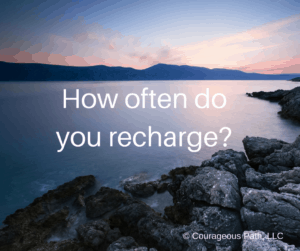 How Often Do You Recharge Your Life Batteries? Seems we are constantly on the go. Rushing from one thing to the next. We barely have time to prep for what we’re doing and feverishly dash out the door. We go aimlessly trying to satisfy people at our next meeting, social outing, or family gathering. We want to squeeeeeze it all in! Yet in all of this mayhem, we forget to take of ourselves. We feel it’s selfish to take care of our own needs. 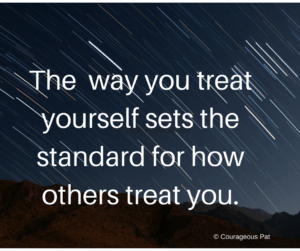 Why should we put ourselves first? The reason is we can’t pour from an empty cup. I know we want to keep others happy. Yet, we can’t sacrifice ourselves in the process. If we’ve spent all our time satisfying someone else’s needs – we’re not taking care of our self. The consequence – we get drained and exhausted. Let’s get back to the airline motto “In the event of an emergency put your oxygen mask on first.” This applies to the rest of us, too! What do you do to recharge? And, How frequently do you recharge? Do you know what happens when we don’t recharge frequently? We finally take that much needed vacation and we don’t until the last day. Then we’re disappointed that we’re heading home. To stay fueled for life, we can’t wait until that next vacation. We can’t wait until the intensity drops off. It may never really happen. The true key is to recharge and refuel daily. Quality sleep: At least 7-8 hours. Did you know that sleep deprivation significantly impacts cognitive ability? Move your body: Get up and move every 60 minutes. Our office lifestyle and sitting behind a desk creates tight muscles and doesn’t allow for adequate blood flow to re-energize us. What can you do daily to recharge, refuel, and wake up refreshed every day? Do You Show People How to Treat You? How you want to be treated is a laughable irony. We often get upset when someone doesn’t treat us they way we want to. We even get pissed off about it sometimes. Ok, a lot of the time. Why did John do that? What did Mary say that? Yet, few of us teach others how to treat us. We’ll complain about it until we are blue in the face yet don’t ever say anything. Here’s a few lessons on how we let others treat us poorly, how we allow it to happen and how to deal with it. First, when someone upsets you or attacks you – do you speak up if someone upsets you? Do you tell the other person how it came across to you? Perhaps what they intended was very different than how the words or actions came out. Or, you are letting them know how the overtly offended you. They may not even realize they crossed the line unless you tell them. Second, how do you treat yourself? If you constantly put yourself down. Do you compare yourself and play the victim role? Or, say, I’ll never be able to obtain that despite yet you’re a PhD with tons of experience. That’s exactly how others will treat you. I watch people get upset with others then watch how much they tell themselves that they aren’t worthy of something or they compare themselves to other people. Lesson #2. How you treat yourself is how others treat you. Treat yourself with the respect you deserve. How you treat yourself is the role model for how others treat you. Third, have you ever been around the kindest, gentlest soul? And, it was such a pleasure to be around an uplifting, positive person. What traits did that person exhibit? Maybe they were kind, open, listened, expressed vulnerability in a touching story. Lesson #3: Be the role model for how others are treated. As with the Golden Rule, Treat others, how you want to be treated. Treat yourself with the respect you deserve. Threat others with the respect they deserve. We don’t have to have the same beliefs to respect others as human beings. You’ve made it. Your career rocks. Your resume is fabulous. You’ve reached a high stature. Then, complacency sets in. Suddenly, things slowly start falling away. Instead of striving for better, we take a back seat on what’s really important to us. As high achievers – Yes – You! – It’s easy to leave parts of our lives astray while we reach for those big goals. Despite these amazing achievements, you suddenly feel there is a missing piece. You’re no longer fulfilled. When we strive for more achievement, we often fail to look at the bigger picture. We take it for granted that our relationships will hold together while we reach for the next promotion. We stop cultivating that rich relationship with our partner or friends. We strive for more and forget to take care of our bodies. Yet, our bodies require proper fuel to sustain this strive. We reach that pivotal goal and forget to take the time to celebrate. As we stretch our time, we stop enjoying our hobbies that spark our creativity and excitement. This all leads to complacency. 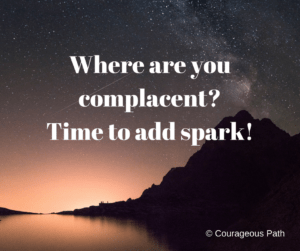 Looking at your life, where are you complacent? Starting today, how can you had a spark back into that area?